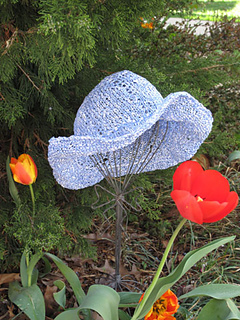 in Rnds 1-9 = 4"
You don’t have to be a mother to enjoy this Mother’s Day Hat! This hat was named for my ever-gardening mother who wisely never heads out the door without her trusty sun protection. 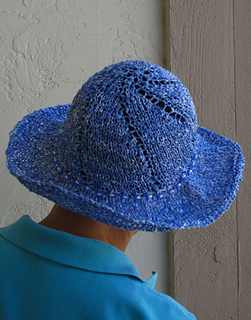 Whether gardening, lounging by the pool, or heading to a sporting event, this lightweight and portable sun hat will keep the burning rays off your face and neck without making your head too hot. The hat is knit with one ball of paper yarn (yes, paper - really!) and is machine washable (gentle cycle). 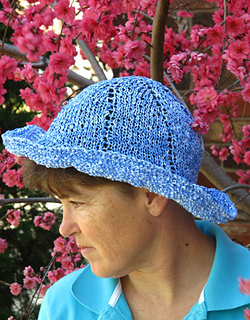 The crown and sides have yarn overs for breathability, and the brim is solid Stockinette Stitch to keep the sun away. The hat collapses easily to stow away in a bag or purse for when you are on the go. “Magic Loop” is the recommended method for knitting this hat, primarily because it makes it easy to try on as you go, but dpns and a shorter circular needle work equally well. your hat and make it all your own!